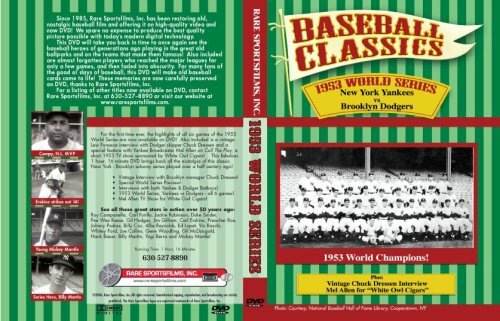 The climax of the New York Yankees’ string of five consecutive World Championships, plus a 1953 interview with Brooklyn manager Chuck Dressen and a TV episode of “Call The Play” with Yankee broadcaster Mel Allen are all included on this new high-quality DVD of the 1953 World Series! To begin the DVD, Lew Fonseca talks with skipper Dressen about his career and some of the disappointments as well as his greatest thrills in baseball. At the end of the program, a young Mel Allen, nearing the height of his career, is shown hosting the 1953 TV sports quiz show “Call The Play” for White Owl Cigars. As tobacco advertising was banned from TV years ago, it is indeed a nostalgic look back at Mel and TV commercialism in the early days of broadcasting. The 1953 Dodgers were probably the most powerful Brooklyn club in history. N.L. MVP Roy Campanella smashed 41 home runs and drove in 142! Duke Snider blasted out 42 with 126 RBIs and Gil Hodges added 31 round trippers and knocked in 122. Carl Furillo won the N.L. batting championship with .344 and Jackie Robinson hit .321. Even Pee Wee Reese hit 13 HR! Add to this a strong pitching staff of 20-game winner Carl Erskine, Russ Meyer (15-5), Preacher Roe (11-3), rookies Johnny Podres and Bob Milliken (17-8 combined), plus Rookie-Of-The-Year Junior Gilliam and slick fielding third baseman Billy Cox, and it’s not hard to see why the Dodgers breezed to the pennant by 13 games over the new Milwaukee Braves. In the World Series, the Dodgers do outhit the Yankees, even though the Bombers out-homer them by one, 9 to 8. But the downfall of “Dem Bums” is their defense (7 errors) and the amazing, record-setting performance of young Billy Martin. Martin bats .500 for the series with 8 RBIs, and breaks Babe Ruth’s old record with 12 hits in the six-game series. He smacks two homers, two triples and a double among the 12 hits (good for 23 total bases), and his single in the bottom of the ninth inning of the final game wins the series for the Yankees! It’s an exciting series with a new record of 17 homers hit by both clubs in the nostalgic setting of two classic ballparks, Yankee Stadium and Ebbets Field! Included is a special pre-World Series look at both teams. Game 1 at Yankee Stadium: Allie Reynolds vs Carl Erskine – Eventual series hero Billy Martin gets the Yanks off and rolling in the very first inning with a bases loaded triple (his first of three hits in the game). Leading 5-4, New York scores three more runs in the eighth off reliever Ben Wade to take the opener 9-5. Jim Gilliam, Yogi Berra, Gil Hodges, George Shuba and Joe Collins all hit homers in this first game. Game 2 at Yankee Stadium: Ed Lopat vs Preacher Roe – Home runs by Billy Martin and Mickey Mantle in the seventh and eighth innings bring the Yankees victory, after the Dodgers lead most of the game. Roe loses a heartbreaker, giving up only five hits in a complete-game effort. Game 3 at Ebbets Field: Carl Erskine vs Vic Raschi - Erskine sets a new World Series strikeout record, fanning 14 men, but still has to battle the Yanks all the way to chalk up a tough 3-2 win. Mantle and Joe Collins strike out four times apiece! Roy Campanella's key home run in the Dodger eighth helps give the Dodgers their first win of the series. Game 4 at Ebbets Field: Billy Loes vs Whitey Ford - the Dodgers rough up Whitey for three runs in the first inning on the way to a 7-3 victory. Duke Snider is the hitting hero with a homer, two doubles and 4 RBIs to pace the Bum's 12-hit barrage. Great shots of balls being hit off the outfield walls of old Ebbets Field! Loes pitches eight full, but is relieved in the ninth by Clem Labine, and the Dodgers tie the series at two. Game 5 at Ebbets Field: Jim McDonald vs Johnny Podres - Mickey Mantle's tremendous grand slam off reliever Russ Meyer in the third inning leads the Yanks to an 11-7 rout in the highest scoring game of the series. Home runs are hit by Gene Woodling, Mantle, Martin, Gil McDougald, Billy Cox and Jim Gilliam. Game 6 at Yankee Stadium: Whitey Ford vs Carl Erskine - Starting his third game of the six-game series, a tired Erskine gives up three runs in the first two innings while Ford holds the Dodgers to only a run on six hits in seven frames, bringing the Yanks into the ninth leading 3-1. Carl Furillo hits a dramatic two-run game tying homer in the Brooklyn ninth, but it merely sets up Billy Martin's game-winning hit in the bottom of the ninth which gives the Yankees their fifth straight World Championship!